Writes like a pen and paints a like brush – two methods in one elegant tool. 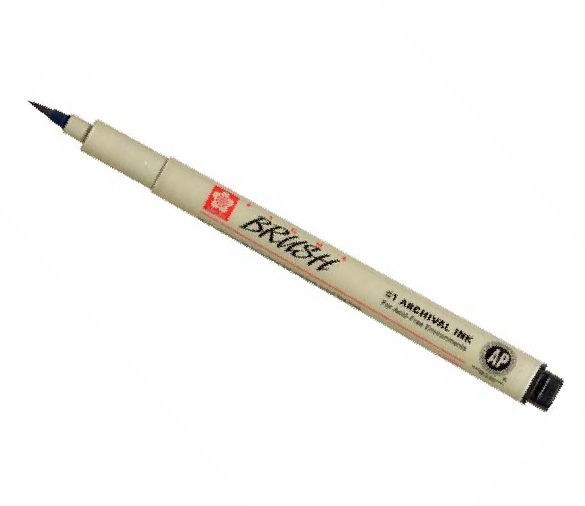 Swirls, doodles, fine lines, and broad brush strokes are possible with this flexible brush-tipped pen. Keeping up with your imagination is effortless. Pigma Brush is comfortable to hold and responds to instant changes in pressure or direction. Vivid, fresh color enhances hand made compositions and conveys personality, style or feelings. Illustrators, Manga artists, cartoonists and hobbyists can put pen to paper and leave a mark that will last a lifetime and is safeguarded by the lasting quality of Pigma ink.